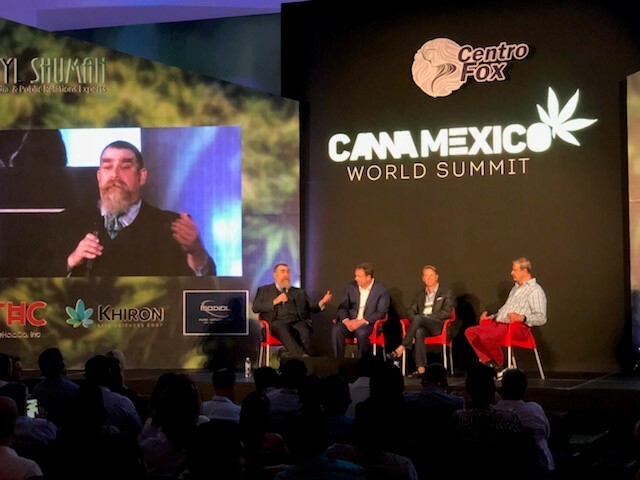 Leslie Bocskor, President of Electrum Partners, a guest of former President Vicente Fox, spoke at the CannaMexico World Summit in San Cristobal, Mexico, held May 30 thru May 31, 2018. Mr. Bocskor participated in a panel that included the former President of Mexico, Vicente Fox Quesada, who has been a staunch advocate of legalizing cannabis in Mexico. From left to right, Leslie Bocskor, President of Electrum Partners, Jay Wilgar, CEO and Director of Newstrike, Matt Hawkins, Managing Principal of Cresco Capital Partners, Vincente Fox Quesada, Former President of Mexico. Like many other Latin American countries, Mexico is considering legalizing cannabis for medical and adult use as well as hemp for multiple markets. With a population of over 120 million residents, Mexico leads the list of Spanish-speaking countries exploring the benefits of legalization. When combined with Spain as well as Brazil, Argentina, Chile, Uruguay, Venezuela and other South and Central American countries as well as Spain and Portugal, the market swells to almost 730 million Spanish and Portuguese speakers worldwide. In comparison, the total US population is roughly 325 million. The main focus of the Summit was to gather leaders in legal cannabis who have global vision and reach to discuss the emerging opportunities in the cannabis industry in Mexico. Numerous industry professionals in finance, medicine, government, technology and agriculture from around the world were in attendance at the inaugural event. Other guest speakers included Dr. Jorge Hererra from Colombia, Julio Calzada Mazzei from Uruguay, Jorge Cervantes from Spain, Ana Maria Gazmuri from Chile, Mario Emilio Gutierrez from Mexico, Dr, Inbar Maymon from Israel, Ethan Nadelmann, Founder of the Drug Policy Alliance and Derek Riedle, the publisher of Civilized, from Canada. But the star of the event was the event’s host, Vicente Fox who was President of Mexico from 2000 to 2006. “I have to get a big shout out to Former Mexico President, Vicente Fox for inviting me and members of the Electrum Partners team as guests to attend this wonderful event,” said Mr. Bocskor. About Centro Fox: Located on the outskirts of Leon, Guanajuato, Mexico, Centro Fox offers a multidisciplinary campus with facilities for international events, business conferences, educational programs, leadership sessions, academic symposiums, philanthropic activities and more. The complex houses a music school and the Hacienda San Cristobal Center. To learn more about how Electrum Partners can help your business CONTACT US.